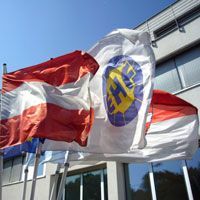 The European Handball Federation’s Headquarters in Vienna, Austria hosted a series of important events and meetings on 7, 8 and 9 March 2011. Here is a summary of the meetings and their outcomes. The European Handball Federation’s Headquarters in Vienna, Austria hosted a series of important events and meetings on 7, 8 and 9 March 2011. Here is a summary of the meetings, events and their outcomes. The week opened with a meeting of the Men’s Club Board at the EHF Office in Vienna ahead of a special evening in the Altmannsdorf Hotel as the Draw for the Last 16 of the VELUX EHF Men’s Champions League was made. Shown live on ehfTV.com, the Last 16 Draw was preceded by a presentation of the new Sharp Perimeter Advertising System to the clubs of the VELUX EHF Champions League, sponsors, partners and guests. The new LCD project is a joint initiative between EHF Marketing GmbH and Sharp Europe. A meeting of the EHF Marketing Advisory Board took place on Tuesday 8 March followed by the second meeting of the Nations Board. This new body, made up of representatives of the national federations including Morten Stig Christensen / DEN, Ulrich Strombach / GER, Phillppe Bana / FRA, Bozidar Djurkovic / SRB, Paul Hoes / NED and Anrijs Brencans / LAT, was elected at the 10th EHF Congress in September 2010 in Denmark. The meeting dealt with preparations for the meeting of the Professional Handball Board the following day. The final group to join the PHB were the Players, represented in an observer status by Marc-Olivier Albertini, a representative of the European Handball Players Union (EHPU). This followed a coordination meeting the day previously between the EHF and EHPU, in which the approval of the Union's structure and statutes as well as the preparation of a Memorandum of Understanding were discussed. The PHB also discussed proposals for changes to the schedule of future EHF European Championships. From the next Men's EHF EURO in Serbia in 2012 it is proposed that the first two groups would throw off on Sunday, with the next two on Monday. Semi-finals would be played on Friday, Saturday would become a rest day and finals would be played on Sunday. This new match schedule will contribute to a better periodisation of match and rest days for the teams and players.